Available as a giclée print in various sizes, please click here. 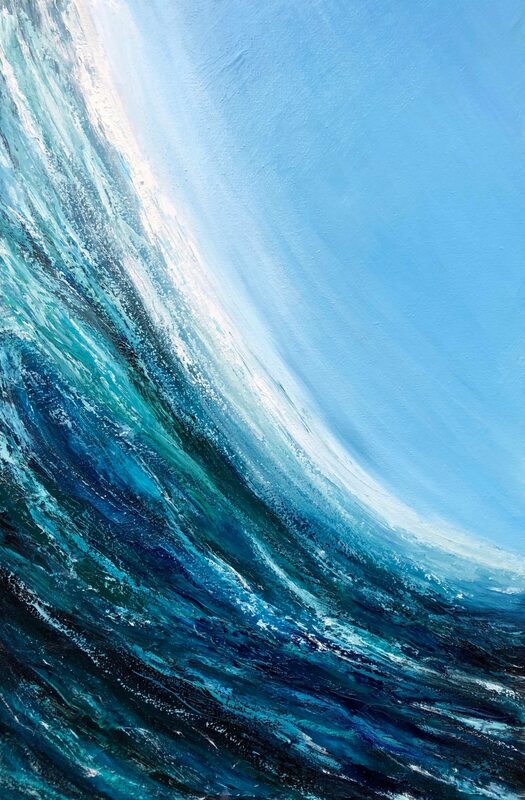 “Emerald Sea” is inspired by the South Devon Coastline and holidays swimming and snorkeling in the Mediterranean sea. This is one in a new series of paintings examining the play of light. Sunlight hitting the shallow water creates a play light showing blues, turquoise, green and indigo ripples. Certainly being a Teignmouth based artist and living close to the Haldon Forest, the sea and Dartmoor, has had an influence on my work. This proximity to the South West Coast and the wild untamed landscape of the moor, as a result, has changed my most recent work. I often return to the work of Kurt Jackson and Peter Doig for inspiration and a sense of place. I am a member of the Devon Artist Network and have recently been given the status of Art Ambassador for the Torbay UNESCO geopark.